Scotland gave their quarter-final hopes another boost as they claimed a second successive bonus point with their 39-16 win over the United States in Leeds. With South Africa back on form after beating Samoa on Saturday, Vern Cotter's team knew they had to match the Springboks' intensity as they faced up to the Eagles at Elland Road. But the sloppy Scots looked shaky during an error-filled first half and Titi Lamositele's 21-minute try allowed the States to claim a 13-6 half-time lead - the first time they had ever gone in at the break on top of a tier-one nation. However, a score 90 seconds into the second period from Tim Visser settled the Dark Blues down and they ran in four more scores from Sean Maitland, WP Nel, Matt Scott and Duncan Weir to claim the extra point. The Scots now top Pool B with 10 points, three ahead of the Springboks - who they face on Saturday in Newcastle. Their joy was slightly tempered, however, by the sight of influential playmaker Finn Russell being carried off midway through the second half with an ankle injury. It was exactly the sort of thing Cotter was hoping to avoid just four days after they had avoid an upset at the hands of Japan. The Kiwi made nine changes to his starting XV. John Hardie had to drop out with a head knock but the likes of Stuart Hogg and Russell were retained for added threat. The Americans were not without experience either. Full-back Chris Wyles and lock Hayden Smith both picked up Aviva Premiership winners' medals last season with Saracens, while number eight Samu Manoa has just signed for European champions Toulon. After a nervy opening from both sides the United States took the lead with an Alan MacGinty penalty - but Hogg levelled matters an effort from halfway. Russell put another kick over but America, muscle-bound and quick, refused to lie down and Lamositele's pick and drive handed the them a try which was not in Cotter's script. MacGinty converted but Hogg could not put the Scots back in front as he skewed another long-range kick. The States, with their powerful hits and rapid line speed, refused to let the Scots get into their stride - and when Hogg did burst through their defences with an inspired run he fluffed a simple pass out to Visser as a certain try was coughed up just five yards short of the line. There was more angst for the Scots when Russell kicked a chunk of the turf up as another penalty was wasted. MacGinty had no such problems as he nailed his next effort just before the interval. Cotter acted, swapping props Ryan Grant and Jon Welsh for Al Dickinson and Nel at the break. The head coach got the response he was looking for within 90 seconds. Josh Strauss barged his way upfield and this time Hogg was inch-perfect with his pass out wide for Visser to score in the corner. Russell tugged his conversion. It was a different Scotland side now - slick and single-minded. Russell cut their opponents wide open with a clever inside pass to Maitland, who darted in to put Scotland back in front after 47 minutes, with Russell converting. 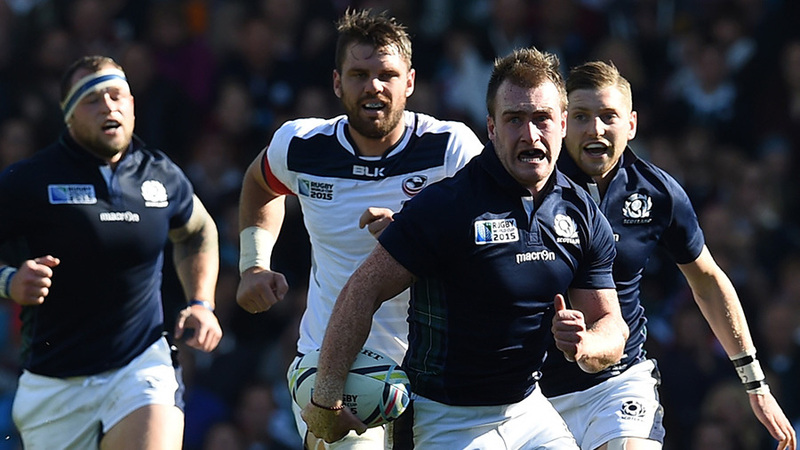 The US clawed some ground back with a MacGinty penalty - but resurgent Scotland continued to squeeze the tiring Americans and sheer blunt force from the forwards allowed Nel to reach over for his first Scotland try from a yard out after 54 minutes. Russell added the extras before going off injured. The bonus point was now in sight and Weir, who had taken over from Russell at stand-off, turned down an easy penalty as he booted into the corner. The gamble worked as the Scots mauled their way into range before releasing substitute Matt Scott to jink his way in for the vital score on 66 minutes, converted by Greig Laidlaw. Weir rounded off the scoring late on with another run from close range, with Laidlaw again converting.